As I was reviewing our customers’ websites and recent results, I noticed an interesting insight. 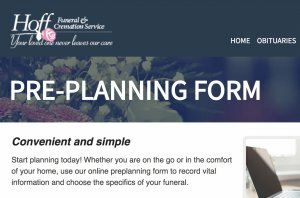 Many of the community members who submit preplanning forms had previous interactions with the funeral home’s website, particularly through the online obituary. For example, one person visited Hoff Funeral Home’s website and left a tribute on an acquaintance’s obituary. Then two weeks later, she actually submitted her own preplan, and later even came back to the website to RSVP to the service of someone else’s obituary! People will become your customers if you offer them an engaging experience, collect their contact information where appropriate, and nurture them over time to stay in front of them and build brand awareness. You don’t always need an aggressive sales message – you can also generate new business through positive engagement and consistent nurturing. If you aren’t getting this kinds of results from your online presence, let’s talk and start getting you new business!